Hi there! Welcome to day two of the August Papertrey Ink countdown. I'm here today to share a few samples using some of this months new dies... Along Came a Spider and Text Block: Halloween. The Along Came a Spider die and stamp set collection is designed to work well for both paper crafting and felt stitching projects. You can use the dies as is, or you can die-cut and then stamp the *stitching* with the coordinating stamps. Keep in mind that these items will be available for purchase beginning August 15th at Papertrey Ink. Plus, more info and a detail look at these items can be found on Nichole Heady blog today. 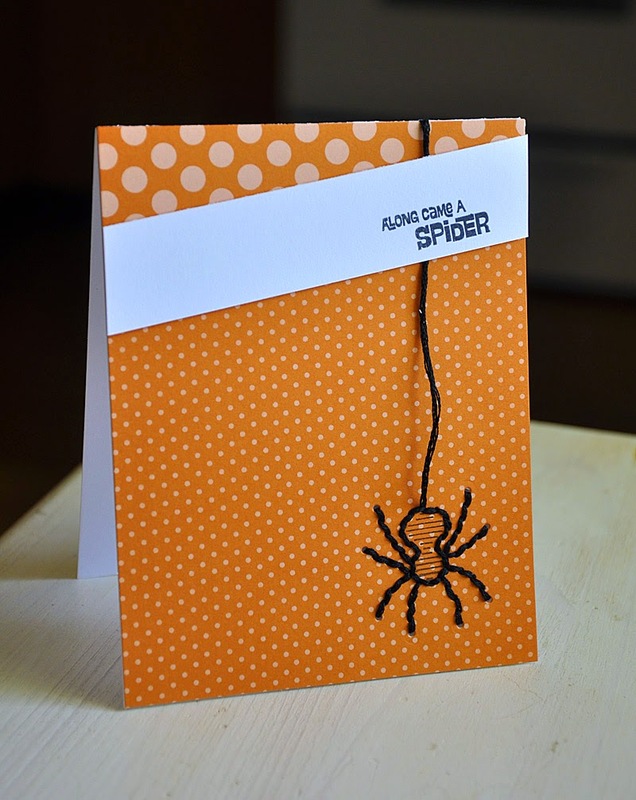 First up, I used the spider die to stitch a creepy yet cute spider onto my card front. I stitched and hung him from a piece of orange zest pattern paper using black embroider floss. 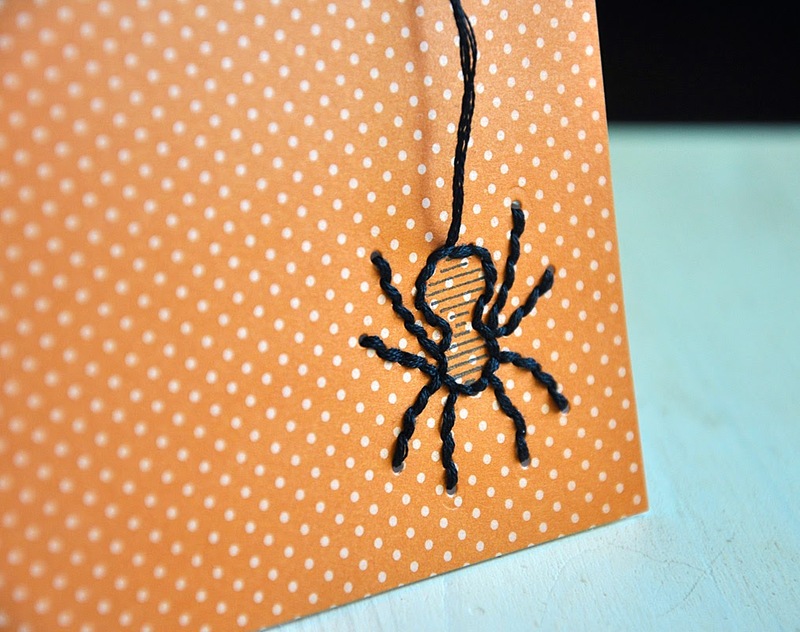 My next card uses the die cut spider which I stamped with the coordinating "stitches" image. I die cut him from royal velvet and mounted him on top of a die cut Text Block: Halloween panel. 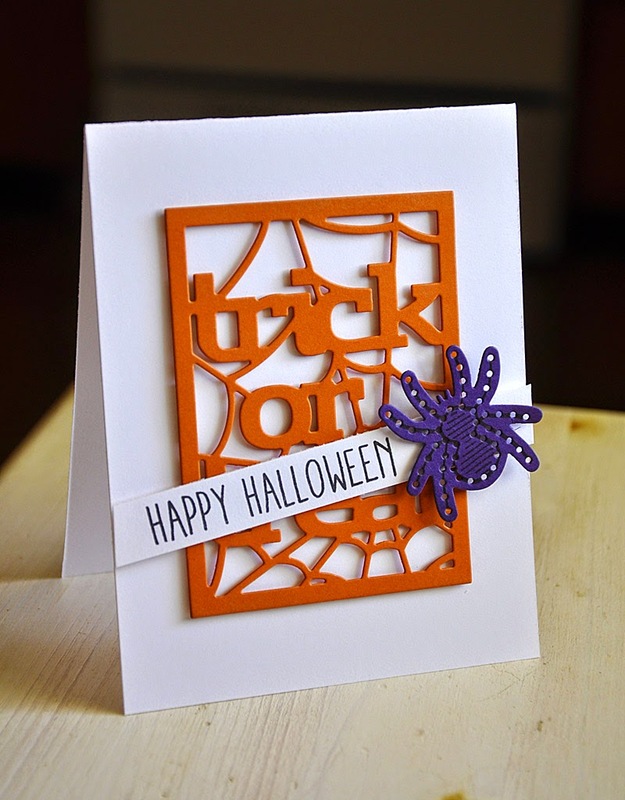 Then finished the card off with a Keep It Simple: Halloween sentiment on an angle. My last card focuses on the Text Block: Halloween die. I began by die cutting the text block panel from smokey shadow cardsock and mounted it onto my card base. 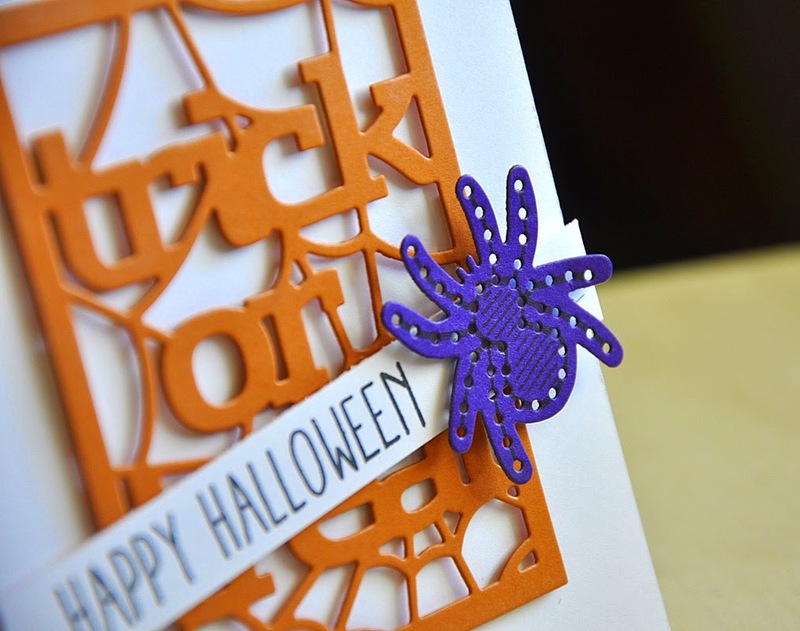 The card base was embossed using the Along Came a Spider dies and then stamped. I then die cut the text block from orange zest and plum pudding pattern papers. Trimmed the words out by hand and attached them into place with a bit of adhesive. Well, that concludes today's look at Along Came a Spider and Text Block: Halloween. Just remember... this set will be available for purchase through Papertrey Ink, beginning August 15th. Halloween done C&S. So perfect! Super fun cards! I especially love the way you covered the text block words with patterned paper!!! Today, CAS stands for clean and sophisticated. The pop of colors on the last card is amazing. Love the dp that you chose for your cards. Love the text block. 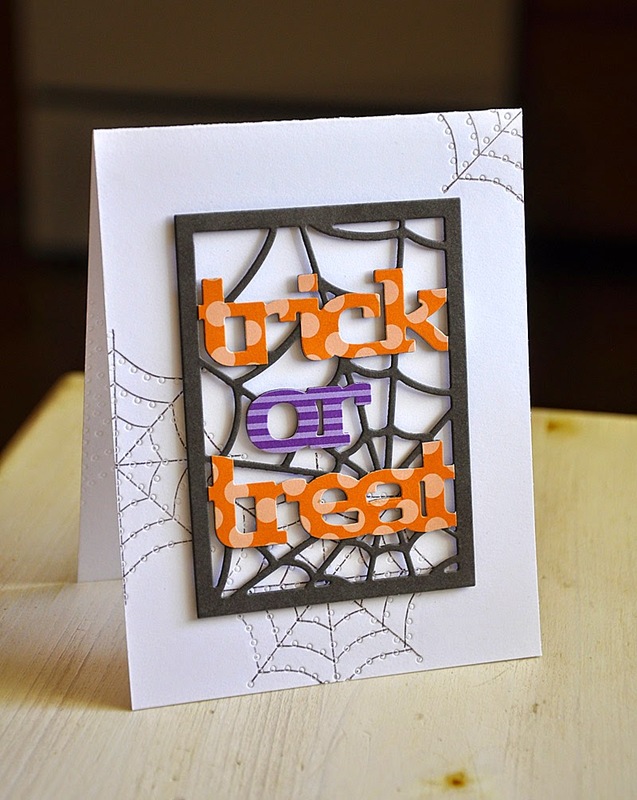 Wonderful cards...I find myself looking forward to Halloween fun! Thanks! Such fun cards. 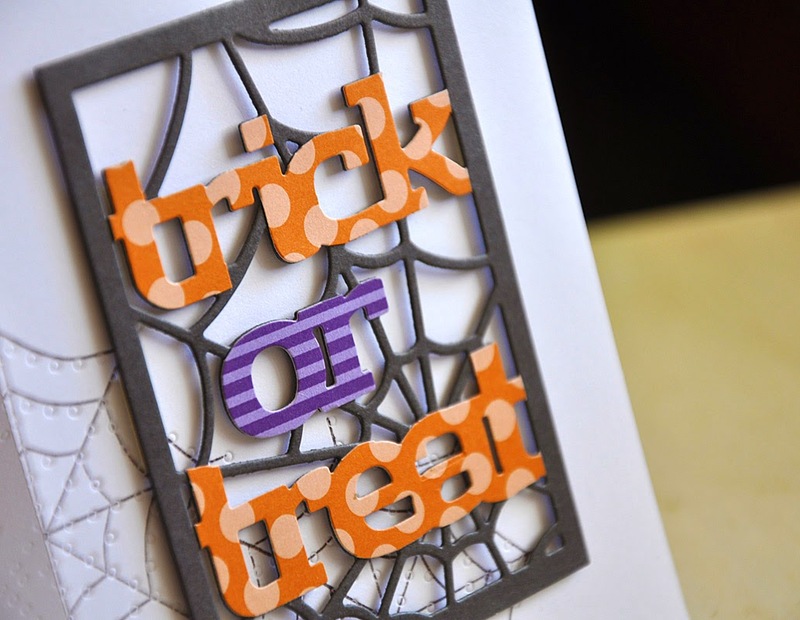 I especially like the trick or treat embossed card- so clean but yet so much wow factor! Super cute cards! I can't wait for this release! It's hard to choose a favorite from this release! These cards are so cute! !